People are familiar with “silicon” since it's the essential element which pushes the evolutions of state-of-art technologies. While few people know about the organic branch of the silicon-based material, silicone, and usually mixed it up with petroleum-based plastics instead. Silicone is one of the most widely used materials nowadays for its biocompatibility, weather durability, and other unique properties. It's commonly used in baby, kids & maternity products, biomedical products, and daily necessities because of the natural bio-inert property of silicone. Silicone is also famous for its thermal and weather durability. It can sustain a wide range of operating temperature from -40 °C to 200 °C and many harsh conditions. Compo-SiL® is a series of silicone sheet product with novel surface technology to create a permanently modified layer on the silicone surface, which makes it become able for further processing. GS has been in the silicone industry for 50 years with particular technology for silicone materials. By combing silicone technology, roll-to-roll manufacturing know-how, surface technology, and polyurethane technology, we successfully develop this break-through composite material. Compo-SiL® is a roll-to-roll composite material of silicone and modified layer. We supply the sheet with customized silicone properties and diverse options for the modified layer.We do claim that the bonding interfacial strength between silicone and the modified layer is more than 2 kgf/cm or more than tearstrength of the customized silicone. 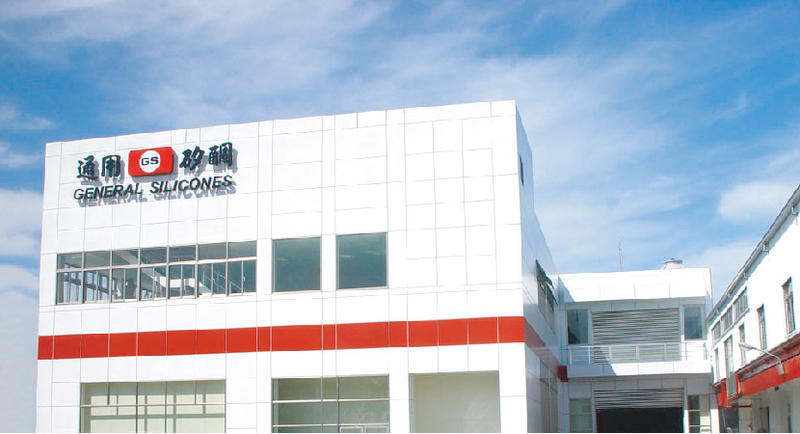 General Silicones Co., Ltd. has been in silicone industry since 1970. GS is not only a significant distributor of silicone material but also an active silicone products manufacturer with ISO 9001, IATF 16949 and ISO 14001 certified. With decades of experience in silicone field, GS has the ability and capacity to provide a wide range of silicone products in automobile / consumer / electronic/ PC and medical industries. In 2018, GS newly revealed the supply of elastomeric composited silicone sheet: Compo-SiL®. 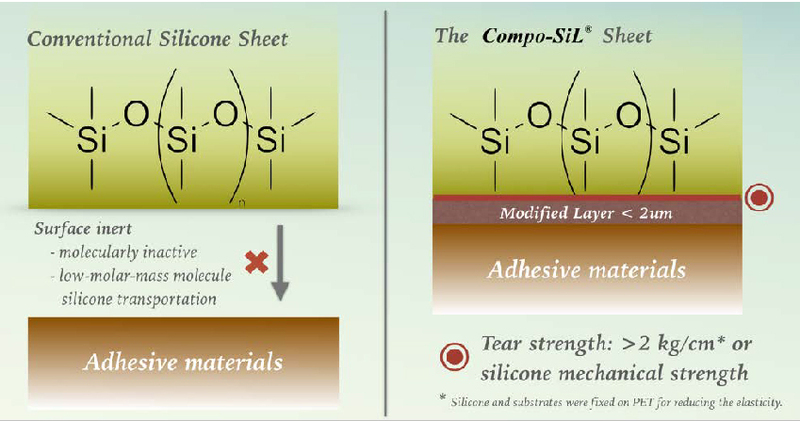 Compo-SiL® is a breakthrough for silicone, which solves the surface inertia of silicone through chemically composite it with the polyurethane-based modified layer. Thus, people can apply silicone to anywhere with diverse adhesive materials or can do further construction on the modified side. Compo-SiL® is not only a composite material, but also an userfriendly and skin-friendly material, a revolutionary solution that brings the purity of silicone to the world.